Slow Cooker Shredded Beef Taco Bowls | Om nom nom! Whisk together the spices and rub into the beef, covering each side evenly. Heat olive oil in a large skillet over medium-high heat. Carefully place the beef in the skillet and sear on each side until browned. Add the beef to the slow cooker along with the onions and garlic. Leave the pan on the heat, and add in the beef stock to deglaze, scraping up any browned bits from the bottom of the pan. Add the tomato paste and minced chipotle and whisk into the pan sauce. Bring the sauce to a boil, reduce the heat, and simmer until the sauce has reduced and thickened slightly. Add the sauce to the slow cooker, cover, and cook on low for 6-8 hours. Remove the beef with a slotted spoon and shred with a mixture of the onions and enough sauce to coat (or to taste). Serve in a bowl over brown rice and add your favorite toppings. 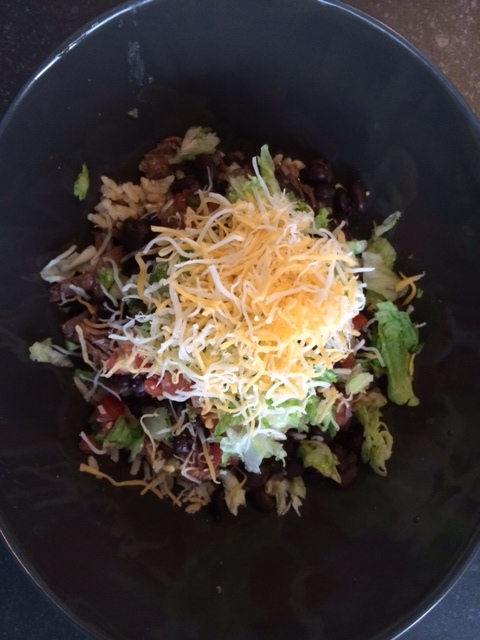 You could also make a taco salad this way – might try that next time!